Work: Practiced Law in Annapolis; Elected to Continental Congress, 1774-1778; Chief Justice of Criminal Court, district of Baltimore; Chief Justice, state of Maryland, 1788-1796; Justice, US Supreme Court, 1796-1811. 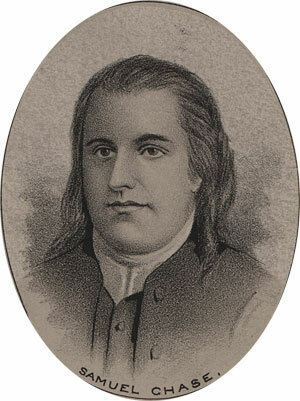 Samuel Chase was born in Maryland on the seventeenth of April, 1741. He received a good classical education in Baltimore. He studied law and began practice in Annapolis. In 1774 he was selected to represent Maryland at the Continental Congress. He was re-elected to that post in 1775, and served there until 1778. In 1786 he moved to Baltimore, where two years later he was appointed chief justice of the Criminal Court of that district. He was later appointed chief justice of the state. In 1796 he was appointed a judge of the Supreme Court of the United States, an office that he filled until his death on the nineteenth of June, 1811.